This past weekend in Southampton, LookToTheStars.org gained exclusive access to New York’s elite as they gathered for the 1st annual Ivy Connect Hamptons Summer Soiree, benefiting Building Blocks For Change and co-hosted by Natalia Kills and sponsored by Cadillac. British recording artist, producer, fashion designer, actress and director Natalia Kills co-hosted the evening with IvyConnect at a private estate set atop a sandy hill, giving you unobstructed views of the dark country sky. 28-year-old Natalia Kills, a self proclaimed perfectionist, has been an active member of English pop-culture since 1995, having started out in the industry at the young age of 9 years old. Drinks and hors d’oeuvres were served as the DJ spun near the pool, as members mingled, danced and had the opportunity to check out the new Cadillac ATS that was up for grabs. Cadillac, the leader of luxury automotive manufactures since 1902, offered a chance for a lucky attendee to drive off with a new Cadillac through a contest on Twitter and Instagram. 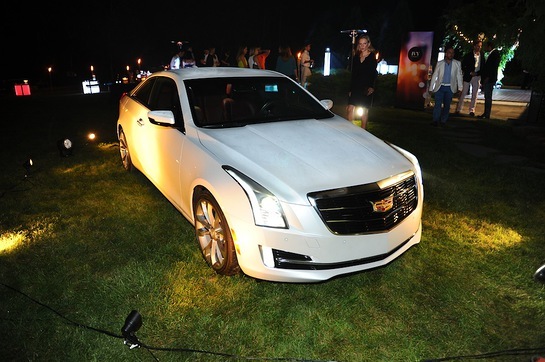 Attendees posted pictures and Tweets with the hashtags #IvyHamptons, #CadillacATS and #WellPlayed for a chance to win. IvyConnect, a private, members only club, is one of the world’s fastest growing social networks that unites innovative entrepreneurs, artists and professionals throughout major cities like New York and Washington, DC. Building Blocks For Change is an organization dedicated to developing sustainable infrastructure that leads to better education, greater global connections and creates an increased quality of life.